​One of the most prolific designers of his generation, Alessio Boschi is also a Storyteller. From fabulous depictions of the world’s greatest monuments and cities to portrayals of Nature’s most splendid creations, Boschi exhibits an extraordinary sensibility and talent in his craft. 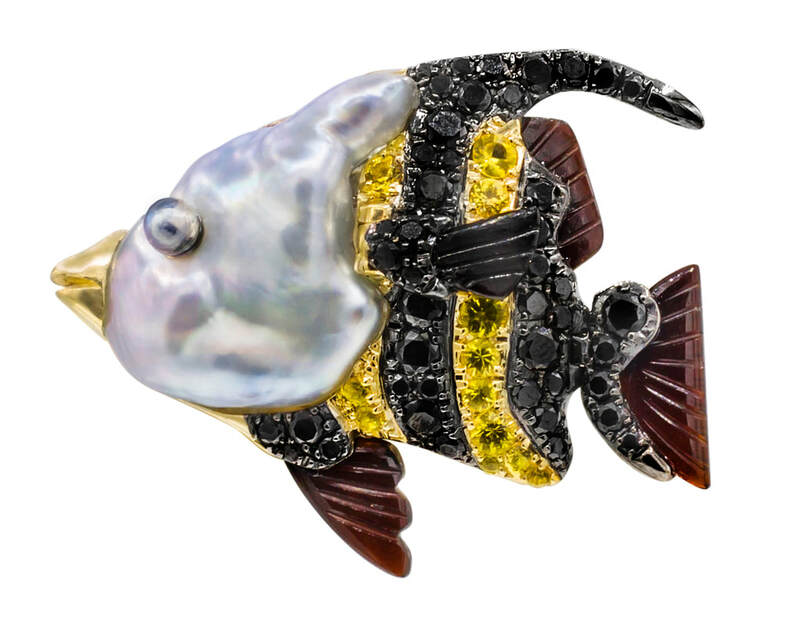 A love for the sea and its exotic inhabitants inspired Alessio Boschi to create a collection that pays homage to aquatic creatures, especially sharks, most notably the Great White Shark. "Unfortunately the number of white sharks is unknown, but estimates indicate that their number has dropped dramatically over the last few years. Some are cruelly hunted for their fins, which are sold to restaurants at a high price, while others are simply killed as a sadistic sport," laments Boschi. "If hunting continues, the species will be extinct in the not-too-distant future." "I would like to call attention to this very real and extremely tragic issue. As an active supporter of campaigns to stop killing this remarkable animal, I am dedicating one of my creations to the Great White Shark," he adds, noting that the "atrociously cruel way of capturing, mutilating the dorsal fin and then throwing the unfortunate animal back into the water causes it to suffer horribly and die a slow and terrible death." 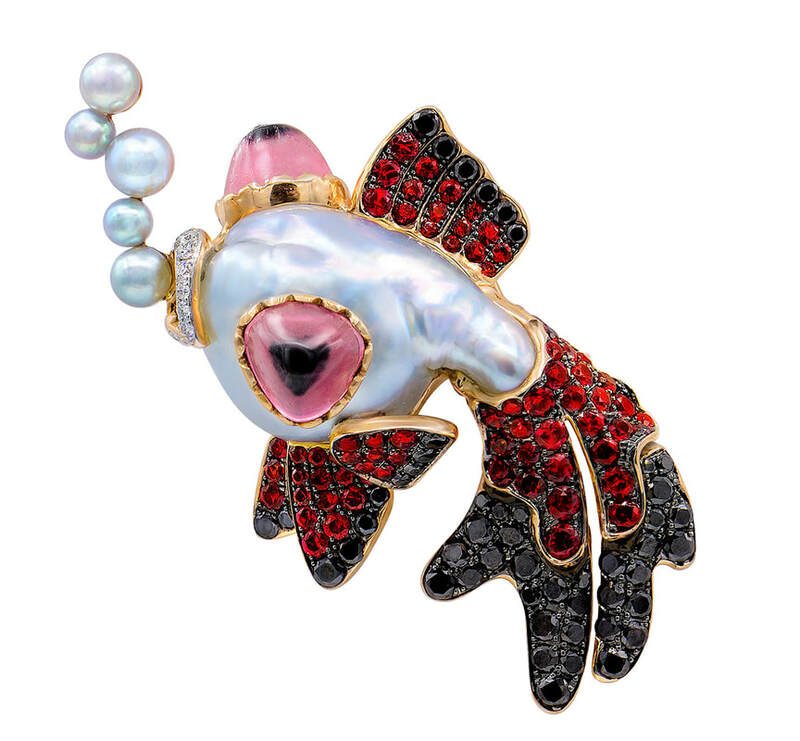 Alessio is donating part of the proceeds from the sale of the brooch to an organization devoted to saving the oceans and its marine creatures. 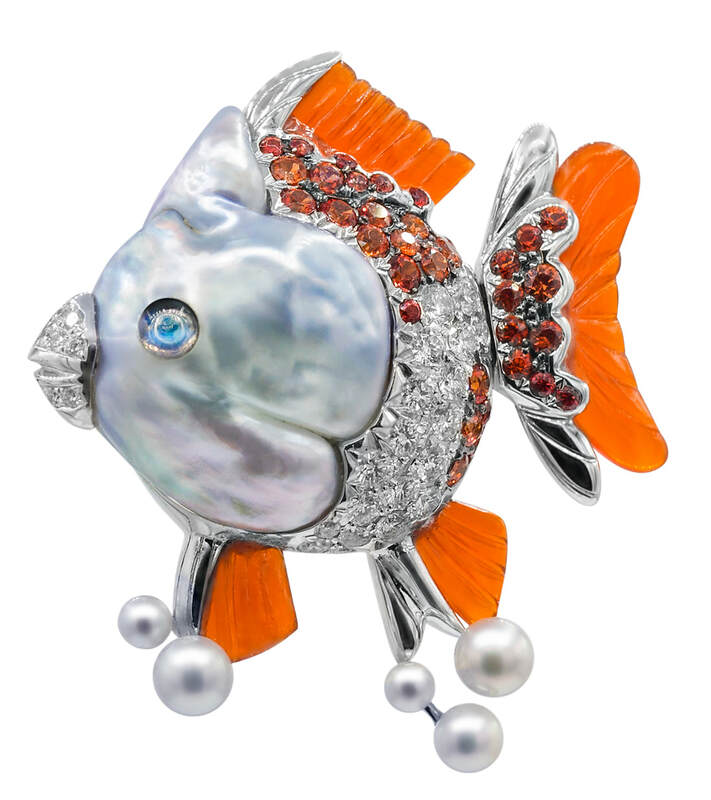 Other sealife immortalized in Boschi's jewelry are the seahorse, clown fish, gold fish, angel fish, fighting fish, starfish, squid, octopus, coral and much more. Many of these are shown here. 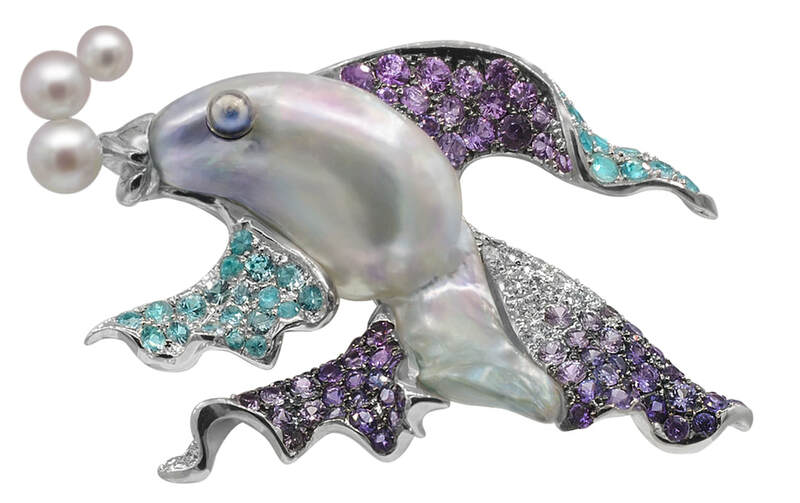 ​"The spark of creation began when I found an extraordinary silver-blue Australian South Sea Keshi pearl in the shape of a shark’s face, with a recessive bump that looks as though its mouth is opening. 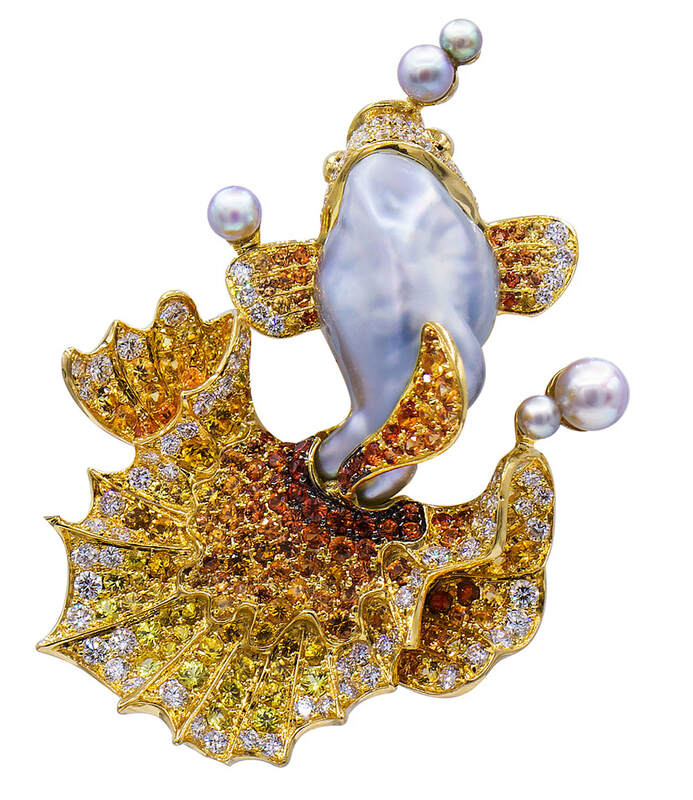 After much research, we finally found several pearls for the shape, color and quality to reproduce the shark’s fin." "Next, we looked for a special gemstone with a very particular color—between blue and gray with a turquoise-greenish sub-tone to capture the hue of the predator’s body. We decided on indicolite (bluish tourmaline) and shades of round aquamarine in mixed sizes." The giant brooch is cast in palladium, which has the advantage of maintaining its cool silvery tone as well as being 40% lighter than gold. 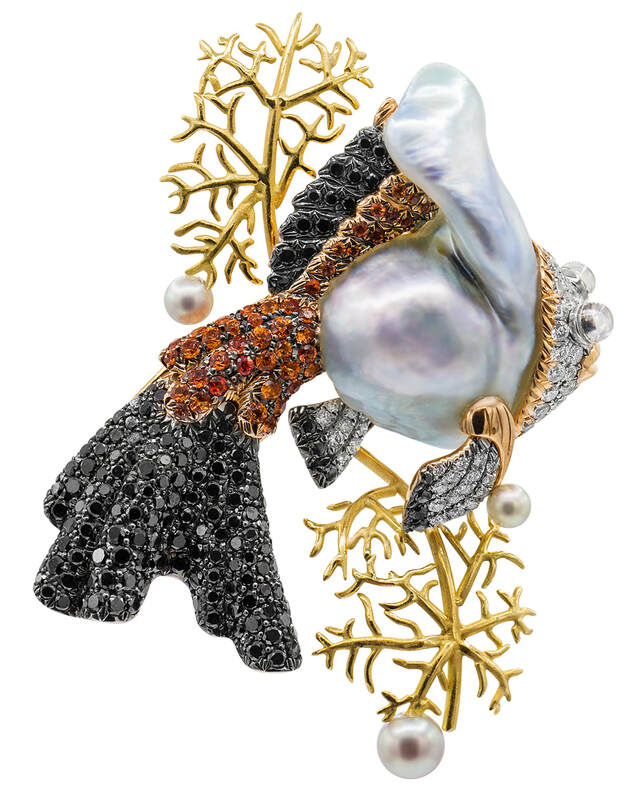 Boschi studied the coral reef of the Pacific Ocean with its wonderful Gorgonian and Madrepore structures and underwater creatures, inspiring him to create a small see-through reef carved in 18K rose gold on the belly. 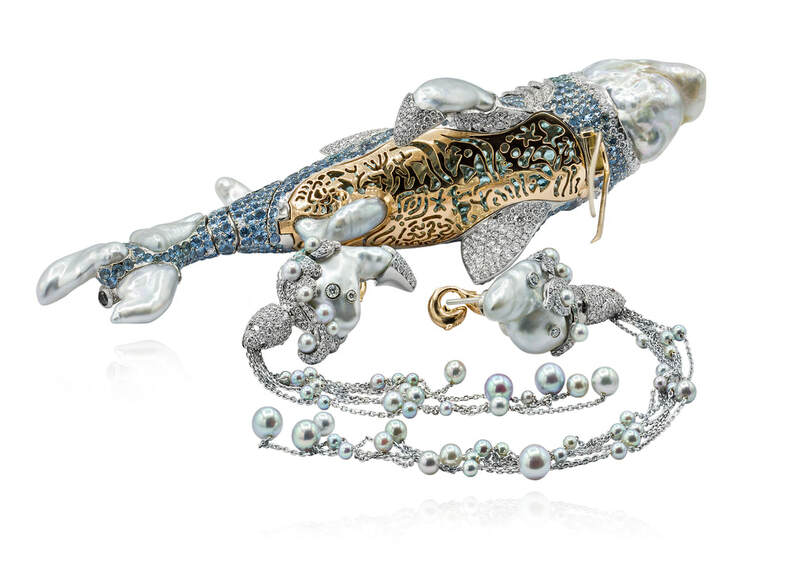 The tail of the shark, made of pearls, is hinged to offer slight movement. The gems are custom-cut to cover as much of the metal as possible. For a three-dimensional effect, the shark is worn with its belly attached to a wearer's jacket, suggesting that an observer could imagine diving into the deep sea while looking at the predator swimming below. 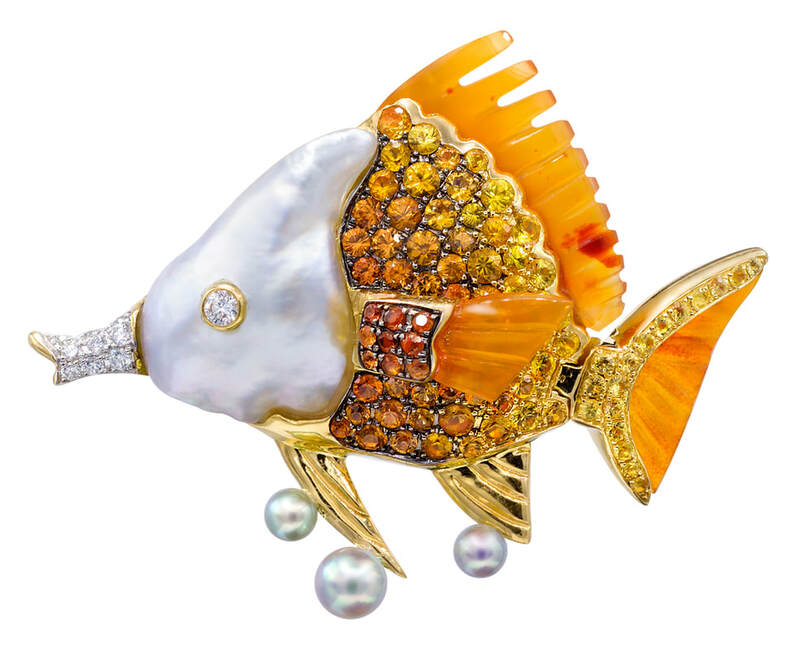 The pectoral fins are set with diamonds and frame the rose gold gallery and double pin. 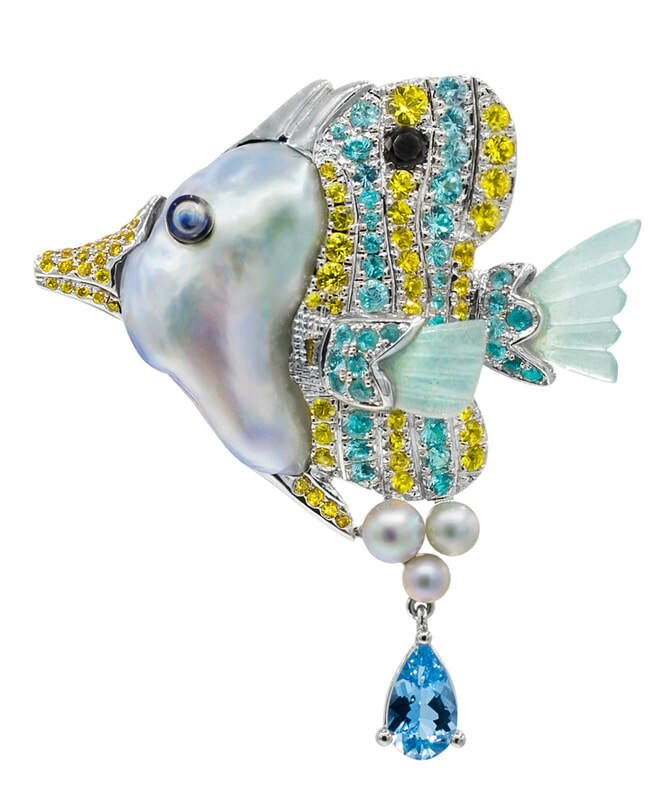 The silver blue dorsal fins, together with the caudal fins, have sparkling diamond details. In keeping with Boschi's style, the shark also holds a signature surprise. "The gallery on the belly allows us to observe the marine life: octopus, seahorse, starfish, various shells, angel fish, clown fish, prickly sea anemones, squid, seaweed, crab and different coral structures," he explains. "Then, by putting a fingernail on a hidden little knob, the gallery opens. Inside is a little blue leather pouch with our logo engraved on a round rose gold plate, which contains a pair of earrings. 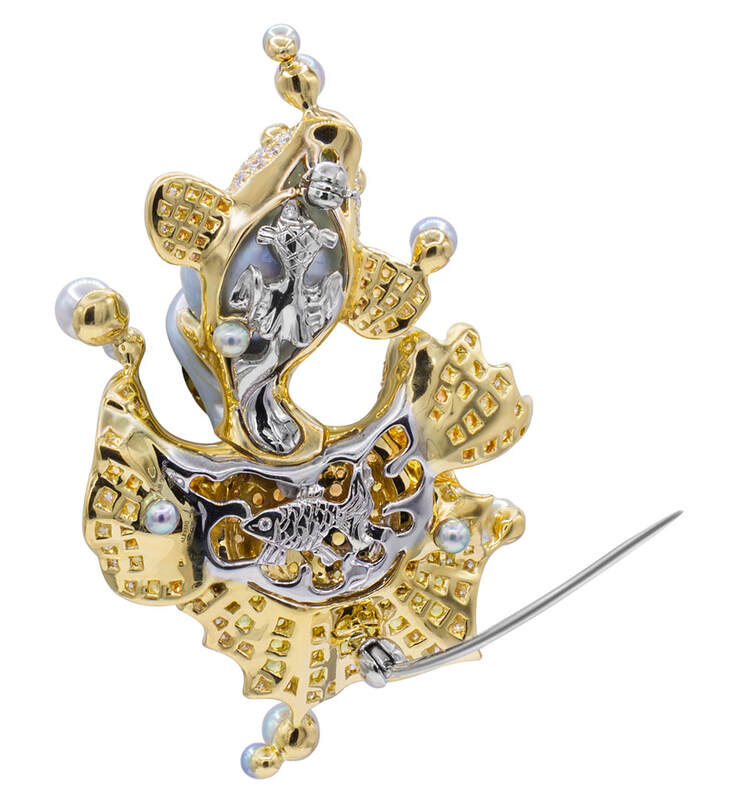 The shark head can be removed from the earrings so they can be worn in a more casual way. 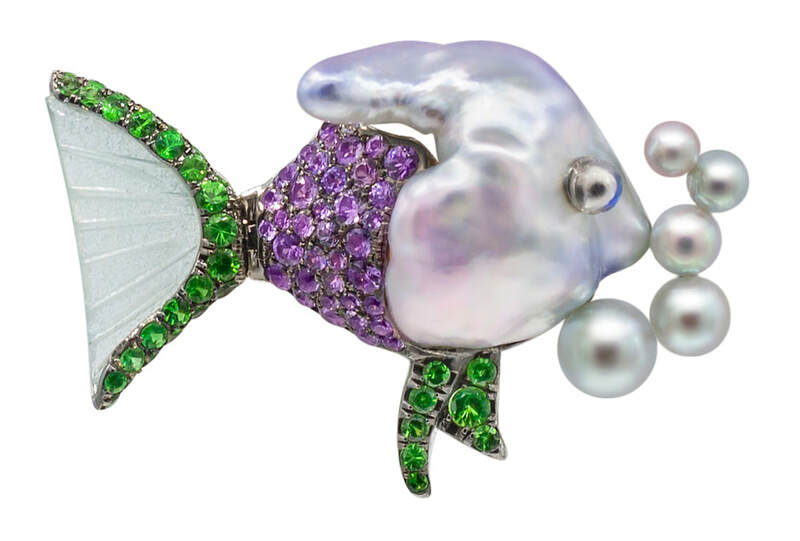 The dorsal fin on the earrings cuts through the sea surface with splashes of turquoise water set with diamonds and Paraiba tourmaline. 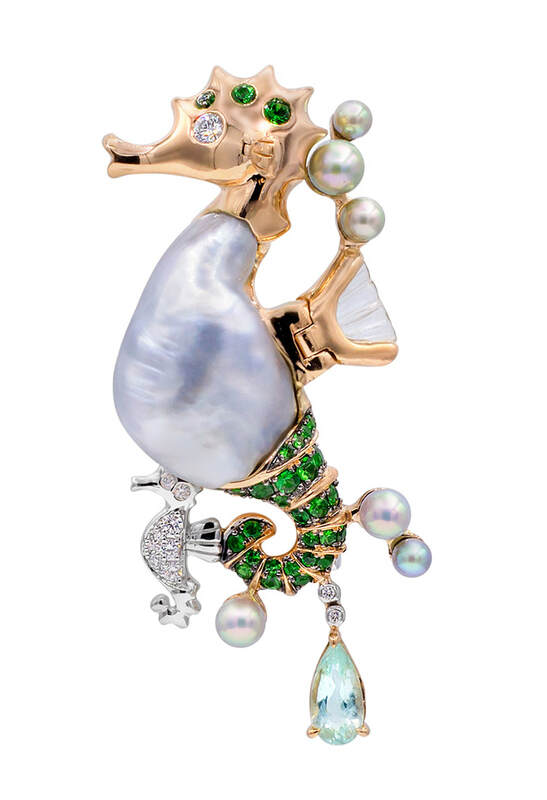 The dangling foam and bubbles are formed from crashing little waves of floating baby blue Akoya pearls. 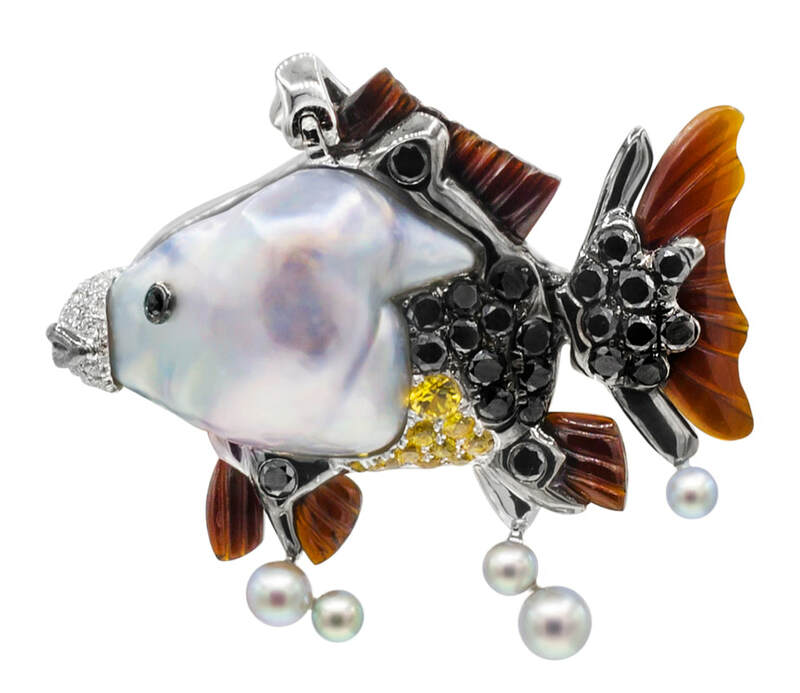 The brooch can be also worn as a large pendant, attached to the shark’s stomach. The shading from blue tourmaline around the body dorsal area to lighter aquamarine near the belly evokes the actual color combination of this stunning creature and its camouflage under the ocean waters.